Global enterprises are rapidly adopting cloud infrastructure like Amazon Web Services (AWS) or Microsoft Azure and software as a service (SaaS) applications such as Salesforce.com or Microsoft Office 365 broadly. The Internet and the cloud are now a part of business-critical infrastructures. Enterprises are becoming a hybrid of on-premises and off-premises assets. To efficiently support the combined public and private resources, the network itself needs to go hybrid, combining the strengths of the highly reliable multiprotocol label switching (MPLS) with the ubiquity, price, and speed of the Internet. 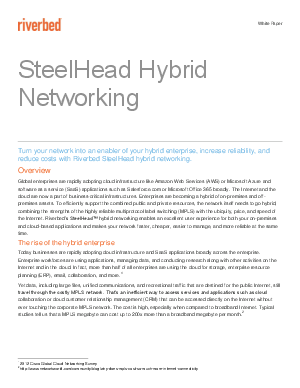 Riverbed’s SteelHead™ hybrid networking enables an excellent user experience for both your on-premises and cloud-based applications and makes your network faster, cheaper, easier to manage, and more reliable at the same time.